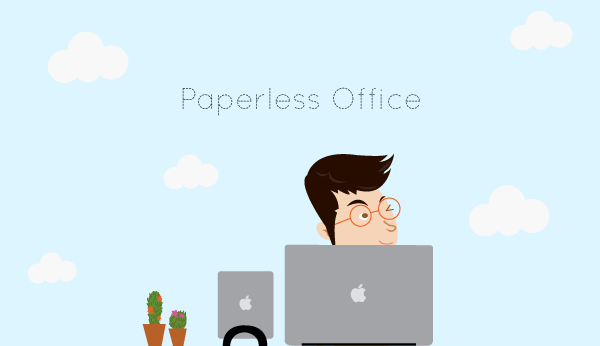 There are many benefits to be gained from going paperless. In addition to avoiding annoying paper cuts, transitioning to a paperless office has a lot of pluses for your business and the environment. According to a post by The Paperless Project titled Facts About Paper: The Impact on Consumption, almost half of the paper printed in offices ends up in the garbage by the end of the day, anyway. Whether you’re onboard with saving the planet one piece of paper at a time or not, there’s still many rewards to be reaped by transitioning to a paperless office. The best part? Most of these reasons are related to saving your business time and money. And what business doesn’t love saving time and money? Even if you’re not able to go entirely paperless (for example documents printed for legal or financial requirements), you can still reap the rewards of having the majority of your documents managed digitally. Here’s 7 benefits of a paperless office (8 if you count no more paper cuts). While I’m sure there are actually people out there that enjoy having giant filing cabinets and drawers full of papers, I think it’s safe to say the rest of the world enjoys having the extra space in the office. This is especially true if you’re starting a small business out of your own home, where your office is a spare bedroom or the living room couch. In fact, this point is actually two benefits because you also avoid having to lug around a bunch of files with you. Meeting a client at their office or at a coffee shop? When everything is saved in a database that you have access to via your laptop or your iPad, you don’t need to worry about fumbling with papers and folders while juggling your coffee and still trying to appear professional in front of a client. Let’s face it, piles of paper always looks messy. Even if you’re OCD and have everything in perfectly arranged piles or separated into colour-coded folders, there’s something still not “pretty” about piles of paper. And papers can easily go missing or end up in the wrong place. Looking for papers in the wrong place can also be a cause of said annoying paper cuts while you frantically look through a pile multiple times because you’re positive you left it that pile. Not to mention the headache caused when you’re looking for a piece of paper that someone else filed, which may have mistakenly ended up in the wrong place. With documents saved in a digital database it’s easy to sort and find things. Even if you accidentally drag something in to the wrong folder, you can do a quick search to find it and drag it back into the correct one. Sharing files is much easier when you have a shared database that everything is saved in. You don’t have to figure out someone else’s filing method or call your spouse at home asking them to please drop off a very important file that you accidentally left at home but you really need to show someone at the office. 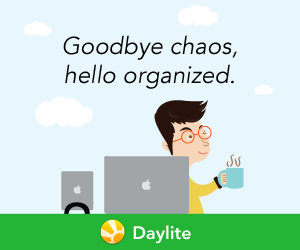 In a shared database like Daylite, you can access a document from your iPhone that your teammate saved on their Mac. You find what you’re looking for quickly and they don’t need to be interrupted for that to happen. By not having to manually dig out files and flip through pages, you can drastically cut down on wasted time. Finding a digital document is a matter of seconds, whereas looking through papers can take minutes or even hours if you can’t remember where you put it. Technology is always improving, making it easier and faster to organize things digitally. But when’s the last time you heard about a filing cabinet with ground-breaking enhancements that make digging out files so much more enjoyable? With the time saved by not having to flip through papers to find the information you need, you’re able to respond to your customers faster. This makes a way better customer experience because you’re able to pickup where you need to in order to help a customer on the phone or via email instead of wasting time digging out the information you need. By keeping information in a digital database that allows you to adjust privacy settings, you have more control over the security of information. For example, you can adjust what employees are able to see specific customer information or internal information. When your information is stored electronically, you don’t have to worry about someone spilling their coffee on an important document or losing it on their way to their car after a meeting. As long as you’re doing routine backups of your database or storing your information in the cloud, you avoid the risk of losing an important document just because someone misplaced or lost it. While there are still certain cases where it’s required to have a paper document, for the most part it’s a no brainer that making the transition to a paperless office is worth the effort.